We can custom make a traffic handle with whatever color and size gear you prefer. Contact us via email or Facebook for availability of the colors of rope or paracord we have in stock and place your order today! 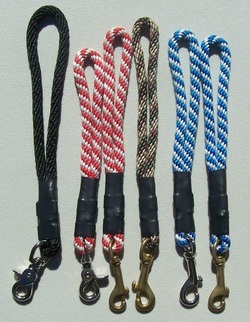 All of the solid poly braided rope we use to make leashes, leads and handles come in various colors, solid and striped; all of the colors available to us are limited by seasonal and local vendor availability. These ready-made traffic handles are only $9.00 each. 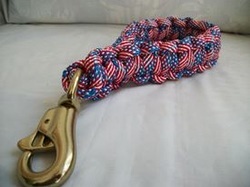 Click the photo to shop our 3/4" braided poly rope traffic handles.